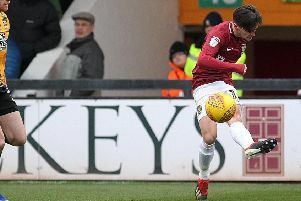 Cobblers defender Joe Bunney has had his season-long loan at Blackpool cancelled - and has immediately joined former club Rochdale. He returned to Spotland on loan until the end of the season. The 25-year-old left-back signed on at Bloomfield Road last summer, but has struggled to establish himself in the Seasiders’ first team. Bunney has made just five starts and one substitute appearance for Blackpool, and has featured just twice in Sky Bet League One since the middle of August. Bunney joined the Cobblers from Rochdale for an undisclosed fee in last year’s January transfer window. He made a good start under Jimmy Floyd Hasselbaink, but then his form dipped along with the team’s. Once Dean Austin took over the managerial reins from the Dutchman followinf the Easater Monday defeat at Peterborough, Bunney didn’t feature for Town again.